Cuts Styrofoam and thermoplastic materials fast! For hobbyists, architects, designers and artists. The working surface is of Alu Cobond compound. This eases the pushing of work pieces. 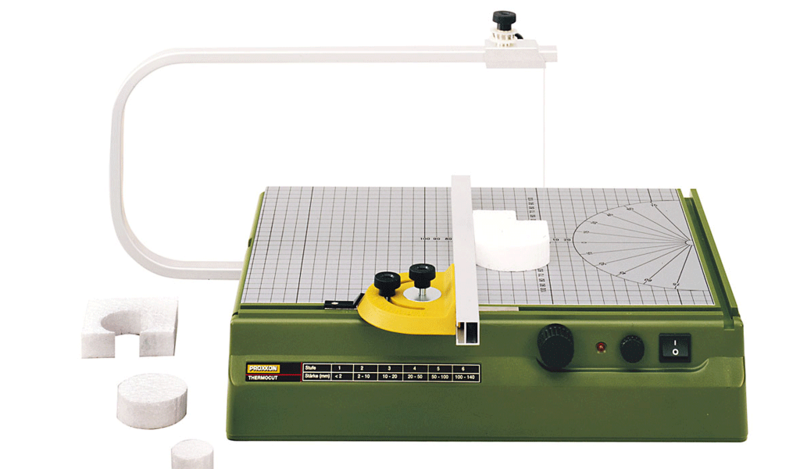 A printed grid and protractor are applied to the base. The large table with 15 11/32" x 11" (390 x 280mm) ensures smooth and easy movement of the work piece. 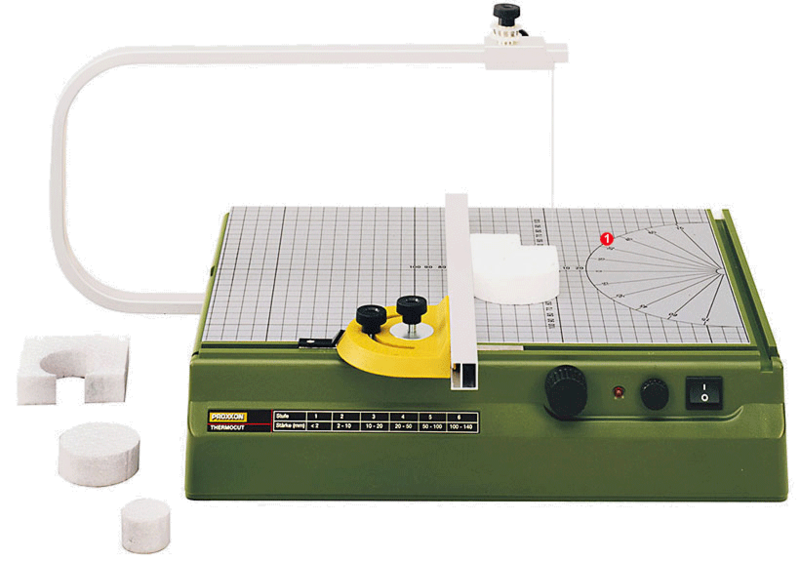 The printed grid and protractor assist with division and cutting. The solid aluminum overarm has a 13 3/4" (350mm) throat and offers 5 1/2" (140mm) in height. The holder and wire coil (one spool of wire 98ft., 0.008" diameter is included) may be shifted and adjusted along the overarm to enable miter cutting. An LED indicates operation and thus reminds you not to touch the hot wire to prevent burnt fingers (the wire heats to maximum in less than 1 second). The correct temperature, being material and thickness dependent, is learned from experience. Profiles are ideally cut at lower temperatures and while applying less cutting force. Spare Cutting Wire for Hot Wire Cutter THERMOCUT 115/E. Made of NiCr 8020. Crosscuts are achieved by means of a simple, yet efficient solution: secure drawing-pin to table with tape, it serves as a fixed center.